The new Titan X, powered by a fresh variant of Nvidia’s cutting-edge 16nm Pascal GPU. The original Titan X was revealed when Huang waltzed into an Epic Games conference at GDC, handed Tim Sweeney the card, autographed it, and promptly waltzed back out. The new version came even more out of left field, when Huang raised his hand after a presentation by Baidu chief scientist Andrew Ng during an artificial intelligence meetup in San Francisco. But enough about the surprise reveal. You want the details. You want the numbers. On paper, the new Titan X appears poised to spank even the ferocious GeForce GTX 1080, which itself delivered a massive 70 percent leap in performance over the GTX 980, and a roughly 30 percent leap over the former Titan X. The GTX 1080 did so with 2560 CUDA cores and 8GB of next-gen GDDR5X memory; the new Titan X packs 12GB of GDDR5X memory not high-bandwidth memory, as found in the full-blown GP100 Pascal GPU—clocked at 10Gbps, along with a whopping 3584 CUDA cores. That’s over 1,000 more than inside the GTX 1080. The new “Pascal” GPU buzzing in the heart of the new Titan X packs 12 billion transistors, making it “the biggest GPU ever built” according to Nvidia. It’s no slouch in the speed department, either. It hums along at a 1531MHz boost clock, which is lower than the GTX 1080’s 1733MHz boost clock speed, but that shouldn’t be a big deal with those 1,000 extra CUDA cores. The original Titan X hit 1075MHz max, and with a mere 3,072 of the older, less efficient Maxwell cores. 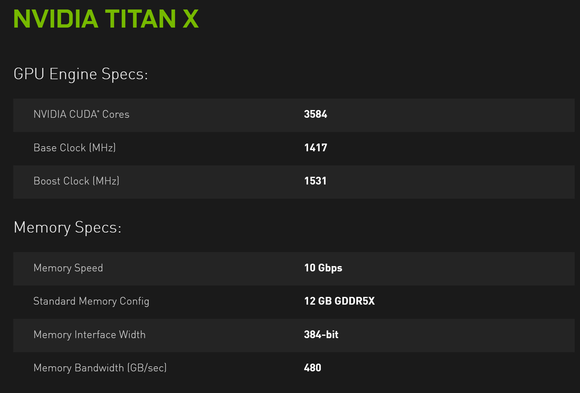 The new Titan X’s key tech specs. So what do all those cores and clock speed stats mean in the real world? Nvidia says the new Titan X offers 11 teraflops of FP32 (single precision floating point) performance, and up to a whopping 60 percent more performance than the previous Titan X. You’ll want to take that with a grain of salt, as Nvidia didn’t say what that applications or games 60 percent performance increase was observed in, exactly. But considering the GTX 1080’s performance and the new Titan X’s gargantuan increase in CUDA cores, there’s a damn fine chance that this beast will be the first-ever graphics card to offer high-quality 60 frames per second gaming experiences at 4K resolution without the need for a multi-GPU configuration—though yes, the new Titan X supports Nvidia’s redesigned SLI HB bridge. That sort of face-melting performance doesn’t come cheap, though. Like every other Pascal GPU-based graphics card in the GTX 10-series, the new Titan X will cost more than its predecessor. While the original Titan X debuted at $1,000, the new Titan X will set you back $1,200 when it launches on Nvidia.com on August 2. Previous article Your Smartphone is making you Fat! ? Did you know?